Are you suffering from sweaty, sleepless nights that result in groggy mornings? When kicking off the covers and turning the fan on to its highest setting fails to improve your sleeping conditions, a cooling mattress topper makes a fantastic, energy-efficient and comfortable option. Aside from conserving energy, toppers often add plushness to beds and further enhance one’s sleeping experience. Although some buyers may initially shy away from toppers with larger price tags, the promise of lower electric bills and higher quality nights of sleep arguably warrant the initial investment. If you're in a hurry check out the ExceptionalSheets Bamboo Extra Plush: It's made out of a breathable material which is the perfect product for anyone who is looking for a topper that works wonders in an overheated home. We've made it easy to find the right one (less than 5 minutes!). Check out the comparison table below for our most up to date picks. Want to see more options? Check our top overall mattress topper buyer's guide. Bamboo is favored for its ability to ‘breathe,’ giving this pad an edge over others in that regard. The hospitality industry on the whole has already taken note, as evidenced by the mattress pad’s debut in Marriott, Omni, Courtyard and other 4- and 5-star hotels across the nation. While the top of the pad is silky, giving users a sense of luxury, the pad itself is rooted in practicality. Plenty of RevoLoft Cluster Fiber Filling, which is engineered to create fiber ‘balls’ that trap air and retain the pad’s shape, enable the cooling mattress topper to hold its shape and facilitate air flow. 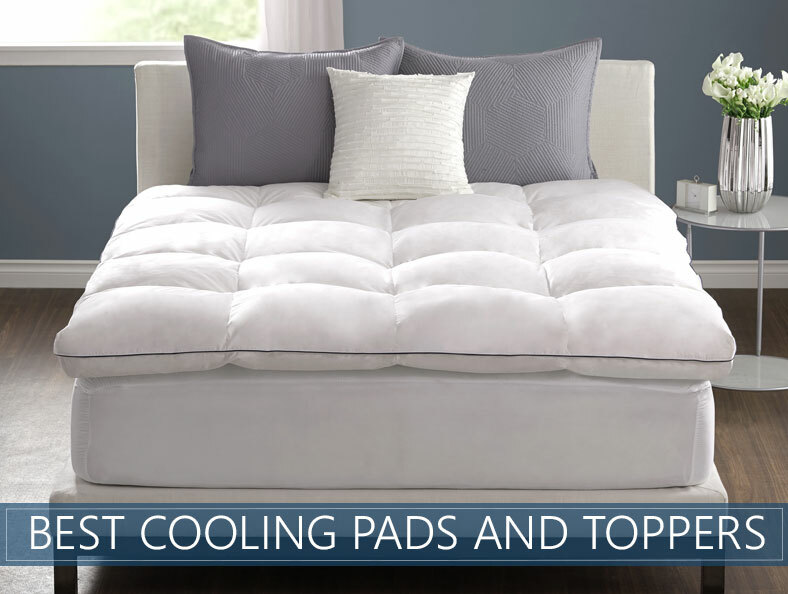 Even for users with heat-holding mattresses like Tempur-Pedic, the ExceptionalSheets pad efficiently cools and comforts; reviewers noted that it dramatically cooled their beds at night time. While the ExceptionalSheets pad lacks the familiarity and customized experience that memory foam mattress toppers provide, the absence of that may be a useful feature. Other positive reviews of the pad stated the pads could promote unwanted heat over extended periods of time, making a pad like ExceptionalSheets’ a welcome addition to an overheated home. 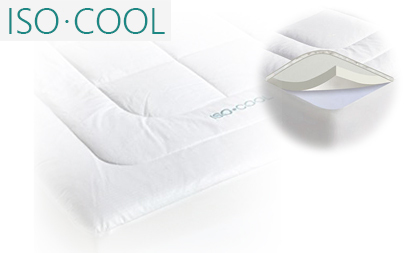 Boasting three inches of visco-elastic memory foam and a cover made out of 100% cotton, the USA-crafted Iso-Cool is a fitting choice that will up your ‘cool’ factor. Most notably, the product utilizes Outlast Adaptive Technology to moderate an individual’s body temperature as it fluctuates over the night. As a result, the topper draws heat away from you and absorbs it, allowing you to achieve a great night's rest; on top of that, the cover is hypoallergenic and machine-washable. Many reviewers of the topper raved about its ability to defeat pain sensations and increase overall comfort; others attributed the three inches of foam to making their nights much more enjoyable. Although others mentioned that the topper is substantial, the extra heft is likely due to the thick foam – a tradeoff that many buyers don’t mind making. For a fraction of the cost of similar bed covers, Night Guard’s Cooling Bed Cover adds a layer of coziness and soothing chill. Compared to other pads, though, Night Guard’s pad doesn’t noticeably change the familiar grooves and feel of one’s bed. It's crafted out of micro-plush fleece. 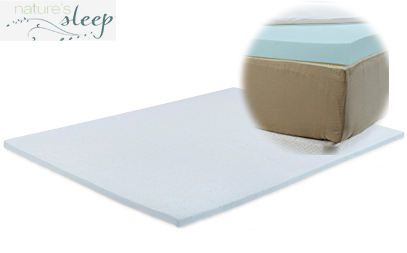 The hypoallergenic pad uses a delicate balance of materials, which ensures a more pleasant sleeping experience overall. Despite the smaller price tag, customers rave about the topper’s quality and its transformative nature; some reviewers even said that they could sleep without any bedding on top of it. Less glowing reviews mentioned that the pad felt thinner compared to others, but the cover’s thinner composition helps ensure that the support and comfort of the mattress underneath isn’t overshadowed. Ultimately, the machine washable and ultra-breathable pad is a solid choice for buyers with more reasonable budgets. The team behind the ExceptionalSheetsprides itself on the pad’s ability to conform to one’s body without jeopardizing air flow. The topper incorporates open cell technology and the integration of gel beads into the topper’s three-pound memory foam, which relieve pressure points and support spine alignment while letting the mattress below breathe. The one-two punch paves the way for restful and pain-free sleep. Multiple customers rate the product highly not only for its level of comfort but also for how comfortably it fits onto various mattresses. One reviewer noted that the pad expanded to its out-of-the-box size almost instantly! If you notice a smell upon opening the topper, as other buyers mentioned, it may be a result of the gel beading technology throughout the product. But for a great topper that uses innovative technology­, others would argue that the smell is not an issue in the long run. Another winner from ExceptionalSheets, this mattress pad comes with a fitted skirt to add both practical and aesthetic appeal to your bedroom. 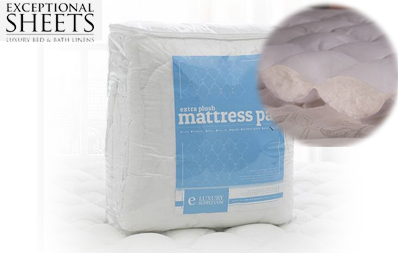 In addition to its cooling quality, the Extra Plush Topper can save you money by restoring mattresses past their prime and adding a cushy layer to otherwise firm, uncomfortable beds. Hypoallergenic cluster down fiber ‘traps’ air to retain the pad’s shape and promote airflow more than other toppers currently available, all while providing the feel of genuine duck and goose down. According to consumers who have used the product, the topper’s materials also make it highly effective against soiling; the machine-washable fabric is easy to clean, deterring any potential stains and smells from seeping in. 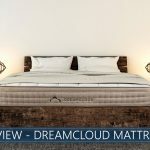 Even more, reviews praise the topper’s advertised ability to breathe new life into older mattresses, saving money and time. Although other buyers say that the pad tends to shift, it’s an easy adjustment that doesn’t detract from the topper’s holistic quality. This topper from Nature’s Sleep steals the top spot concerning price, but the extra dollars earn their keep. The pad, which uses all-new, patented AirCool IQ Gel technology, simulates the support and comfort of a thicker topper without the actual weight and dense materials. As a welcomed result, users can enjoy the pad’s cooling effects and customized pressure point reduction molded to one’s body. 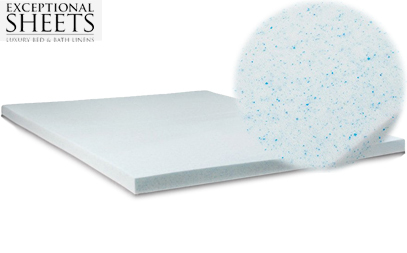 Besides, the product is CertiPur-US certified, guaranteeing that the foam is of the highest quality. Reviews of the cooling topper call out its added capacity to stifle creaking and other sounds – another common irritant that can disrupt one’s sleep. And amongst the multitude of shining comments about its plushness and general comfort, other reviews note that the pad can expand without problems and lacks any nose-wrinkling odors. Despite its heftier size that makes moving it more of a challenge, chances are that you won’t plan on moving it anytime soon; its microfiber cover is easy to remove and clean, protecting the pad’s quality year over year. The Gel Infused with ViscoSoft highlights four qualities: body temperature regulation, body contouring, pressure point relief and the elimination of motion transfer. It costs less than nearly all of the toppers mentioned on this list but succeeds in fulfilling its four promises. A temperature-controlled surface helps disseminate body heat equally throughout the pad, while the high-density memory foam hugs your body without sagging. Buyers across the board have raved about the topper, claiming that it’s improved their sleep quality and lived up to its cooling standards. New parents and chronic pain sufferers are among the reviewers who gave the product a thumbs up, supporting its place on our list of top toppers. ViscoSoft proudly calls out that their pad weighs 42 pounds – more than twice the weight of other competing brands – but follows that statement with the assurance of delivery to one’s door for convenience. The sizable topper may deter some potential buyers, but ViscoSoft asserts that greater weight, in this case, correlates with premium quality. There’s only one factor that distinguishes a cooling pad for your bed from a regular mattress topper, but the sole reason is more than enough. Muggy climates, hot flashes and more can quickly escalate from minor irritants to full-blown problems, turning away the Sandman night after night and leaving you restless. Many sleep-deprived buyers end up frustrated, though, because not every topper advertised as ‘cooling’ delivers on that promise. Some are initially cooling, but fleeting; according to other reviews, they have no effect at all. It’s important to note that certain individuals naturally become warmer more easily than others, but take into account the consensus of multiple reviews as well. When shopping for a new pair of shoes, the slightest discomfort – such as a hint of snugness around your toes – can be a deal-breaker. No matter how much you may like them, aesthetic tries to yield to practicality when it comes to products that are intended for comfort. The same goes for pads for your bed; you may not be wearing them on your feet, but they separate you from the ground and serve to optimize comfort. Unfortunately, what’s satisfying for one person is another’s annoyance or pain. Comfort, especially about something like a mattress pad, is subjective; hence, the success of mattresses that can adjust firmness on both sides of the bed. A cooling mattress topper, then, needs to be supportive without feeling too rigid; plush, but not too soft – it’s a common concern that plagues buyers of all shapes, sizes and sleeping arrangements. Simply put, if your bed doesn't measure up to standard mattress sizing, you will have a difficult time finding a topper. Although toppers are supposed to be able to stretch and grip around beds over varying sizes with ease, not all of them live up to that expectation. Others may perform well initially, but lose elasticity over time, which results in unwanted shifting of the pad. And if the bed is not a traditional size, for example, it's almost impossible to find a suitable topper. Contrary to the eponymously named game show, the price is not always right. A cool mattress pad isn’t something that you need (or probably want) to purchase more than a couple of times in your life, so it may pay off to splurge and go for a pad with a higher price tag that matches its higher reviews. Despite the universal need for sleep, though, there is not a universal budget that applies to every mattress pad buyer. When push comes to shove, if your allocated spend for a topper is under $100, and your partner’s favorite pad is $200, you’ll have to determine which option(s) best fall within your parameters. Just remember that at the end of the day – literally and figuratively – you’ll be using your topper more frequently and for more extended periods of time than almost any other item in your home. In a perfect world, you would only have to relocate your cooling mattress pad once. A quick removal of the packaging and a heave onto your bed would be the only labor required from you, giving you long-term comfort with little effort. But in a real world, you’ll likely want to wash your cooling pad now and then, and you may move homes one or more times throughout your life. Heavy cooling pads, then, pose a problem for owners; without assistance, even dragging a pad from one room to another can dissolve into a major struggle. When shopping for a topper, make sure to consider how easy it is to move it – whether you’re transferring it to another room, or to another country. On top of that, take general storage and care into account: can it be packaged and stored efficiently? Will it fit in your washing machine? Does it require special detergents or professional care? There’s no need to resign yourself to nights of tossing, turning and excessive sweating. A cooling pad requires little effort – there’s no installation, and companies will often ship the pad straight to your doorstep – but the payoff can be monumental. Dream-filled, consecutive nights set the stage for productive and fulfilling days; why deprive yourself of that accessible luxury? Quality cooling toppers can chip away a couple of hundred dollars, but purchasing one is a single transaction that makes a lasting difference. Compare that to your electric bill, which may rack up even more costs year over year. Ultimately, a cooling topper is a better decision for your wallet. It’s a favorite trivia fact and a startling reality: roughly one-third of our lives are spent sleeping. Given how much shut-eye we need to function and thrive, it only makes sense that we invest in the products and innovations that help make that third of the pie more enjoyable. 1. Which mattress pad is right for me? There are plenty of factors to consider when selecting a mattress topper that best suits your needs. 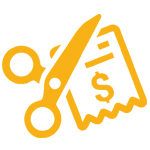 Are you working with a more restrictive budget? The Night Guard and ViscoSoft toppers are both lower-cost options but hit many of the critical points that buyers are seeking out. Worried about lingering pain? Pads like the Iso-Cool or ExceptionalSheets Gel toppers may help alleviate those discomforts most efficiently. Sleeping with a partner? 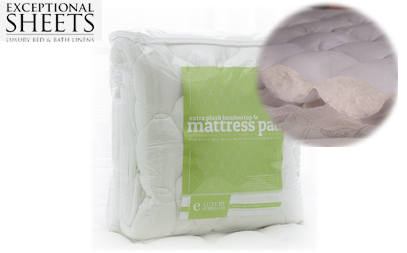 Hone in on a mattress pad that decreases or wholly eliminates noise and motion, such as Nature’s Sleep Pad. As you deliberate, questions like these will help you narrow down your options. 2. How can I keep my mattress cool during warm summer nights? The toppers are designed to increase air circulation and allow mattresses to breathe, so little else is required on the user’s part. If you want to enhance the cooling effects of the pads, consider investing in bedding made with more breathable fabrics, like bamboo. In addition, we highly recommend you implement a cooling blanket during hot summer nights. Rest assured that your mattress topper will serve you well year over year. Just like regular mattresses, toppers are not meant to be thrown out and replaced frequently. With proper care, you should be able to use it for years; pads with removable covers are also more predisposed to stay clean and ‘fresh’ for a longer duration of time. Want something that will last roughly 10 years? Check out our top cooling mattress picks. 4. What are the best bed sheets to keep me cool? There is a variety of bed sheet options to upgrade your sleeping conditions on unusually warm nights (great tips to cool down). Proponents of synthetic bedding, which is engineered to fight against climbing temperatures, claim that the state-of-the-art fabrics can achieve what natural products lack. But some of these materials are treated with particular chemicals that can wash out over time, reducing their potency. In contrast, natural fabrics like linen, cotton, and bamboo are hailed as tried-and-true materials that help prevent sweat from absorbing. However, make sure to purchase bedding with low to medium threat count (between 200-400); higher thread counts trap heat more. 5. How do I keep cool while sleeping on a hot memory foam mattress? A cooling topper for your bed can offset the stifling heat that can emanate from a memory foam mattress. Luckily, thanks to innovations like gel memory foam, you don’t have to sacrifice your memory foam for a cool night’s sleep! Update: We just released our memory foam mattress pad/topper buyer's guide. Keeping your bed cool and your nights restful doesn’t have to be an ordeal. A high-quality, cooling mattress pad can compensate for less-than-optimal sleeping conditions and improve breathability and comfort – without breaking the bank. Given its plethora of high reviews and its mid-range price, we recommend the ExceptionalSheets Bamboo Extra Plush Lightweight Cooling Mattress Pad with Fitted Skirt – its lightweight features keep beds cool at night while sparing buyers the stress and strain of moving a heavy pad. 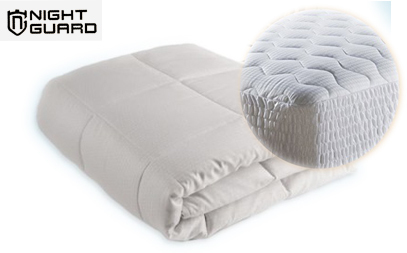 The topper also adds some extra plushness to mattresses without compromising the qualities of the bed beneath it. Although it’s important to be mindful of factors like budget and size, it’s even more valuable to remember that your purchase is a long-term investment for your well-being. A good night’s sleep doesn’t have to be a dream – with the right cooling topper it's more than possible. What’s The Best Mattress Topper (Pad) For Hip Pain In 2019? Hi JD. That’s a great question. You may consider swapping out your existing topper for one that is cooler, but it most likely won’t have precisely the same feel as the memory foam option you already have. 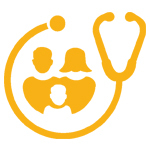 hi i purchased a medical bed (single) a year ago sadly it had no mattress so i purchased a mattress $500 i have not had a nights sleep ever since a single hospital mattress is $1400 which i don’t have i get so hot i feel like a roast potato i also only sleep for an hour or so at a time all these mattresses are double queen or king do none of these manufacturers make a single? Hi William. Thanks for reaching out. This article is for toppers and pads and most are available in a single size as well. If you’re looking to buy a completely new mattress, we have lists of mattresses as well. Be sure to check those out.